You are here: Home 2013 February Is Cisco Bothering With “Open” EIGRP? Is Cisco Bothering With “Open” EIGRP? EIGRP is an example of an Interior Gateway Protocol (IGP), which is a network routing protocol that routers use to exchange routing information within an autonomous system (AS). EIGRP takes its place alongside other frequently-encountered IGPs such as Routing Information Protocol (RIP) and Open Shortest Path First (OSPF). One of the characteristics of EIGRP that sets it apart from other IGPs is that it is a Cisco-proprietary protocol. This means that Cisco keeps private all of the documentation that describes the inner workings of EIGRP, and EIGRP is only implemented on Cisco products. RIP and OSPF are open standards, specified in documents known as Requests for Comments (RFCs), which are maintained by the Internet Engineering Task Force (IETF). Because they are open standards, RIP and OSPF are implemented by nearly every networking equipment vendor, including Cisco. All this is about to change, now that Cisco has announced at Cisco Live London 2013 that they will be releasing EIGRP to the IETF as an informational RFC. What this means is that vendors other than Cisco will now be able to implement EIGRP on their networking products. Cisco has indicated that they will assist with interoperability testing to ensure that these non-Cisco EIGRP implementations work properly and can be integrated smoothly into existing Cisco networks. Why would Cisco do this? Some customers prefer the flexibility of a multi-vendor solution. While EIGRP is an excellent choice for interior routing in networks large and small, some customers are hesitant to get locked into a single-vendor solution. With EIGRP as an open protocol, these customers will now be able to consider EIGRP based on its technical merits rather than whether it is a single-vendor or multi-vendor solution. Cisco has announced that they will be releasing basic EIGRP via this informational RFC. Cisco will still maintain control of EIGRP, but now other vendors will be able to implement it if they choose to do so. There will be some advanced features such as EIGRP stub that Cisco will not be releasing and thus will only be available on Cisco products. Why Is Cisco Bothering With “Open” EIGRP? My first taste of networking came via the Cisco Learning Academy. I did my CCNA and the old school ROUTE, and it did a pretty good job of praising the joys of EIGRP. You learned EIGRP early on, and it was always made to sound superior. The skills tests and all the labs revolved around EIGRP. It seemed awesome at the time. OSPF was referred to like “that Uncle” that everyone has and is scared to have around their partner. I came across an article earlier that stated EIGRP was to be made an open standard. Cisco finally must be getting a bit sweaty under the collar if they are doing this. They know most of their customer base uses OSPF. Juniper, their fiercest opponent, have proliferated OSPF users due to a high number of router sales. This has tipped the scales WELL in favor of OSPF. Upon seeing the article title, I got excited. EIGRP would be open. 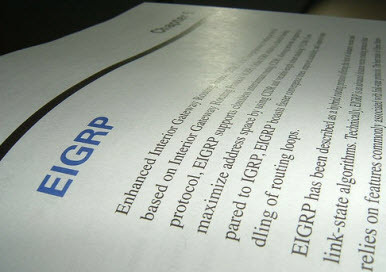 A draft is released to the IETF, EIGRP becomes ratified, and some vendors may pick it up. Most arguments against EIGRP recommend avoiding it due to vendor lock-in. No one wants to be stuck with a proprietary protocol. This is compounded by the fact that financially viable, sound alternatives exist to Cisco these days. Back when EIGRP was the best thing since sliced bread, there wasn’t much competition. Like Cisco licensing, a big stumble occurred in the second paragraph. What Cisco should have said in its announcement was that, “Cisco EIGRP is now an open standard, but…” The article goes on to list three things that irked me right away, and gave me the notion to rename their article. Advanced features of EIGRP (namely stub areas) will not be released to the IETF. Informational RFC allows Cisco to retain control of the EIGRP protocol. EIGRP is still technically proprietary. So, the advanced features of EIGRP are not being released–no stub areas, no way to control propagation or logically define areas. No DMVPN topologies that will scale. This is one of the primary reasons you would use EIGRP. In a past life I did a deployment, and I’ve labbed many since. It works and works well, but you can learn to rearchitect around it. Why do that? Because other vendors offer such a better price point that it is cheaper to migrate than pay to be locked in, a giant area to be sad about. Sure, you could run different processes and redistribute between but you shouldn’t have to just because Cisco wants to hold the keys. Cisco’s best interests will always guide the EIGRP protocol. This could potentially lead to stifled innovation from the outside, as they have final say. On the one hand, they ask vendors to develop, but still tightly control the best features. I do understand protecting customers who’ve invested in it, but why bother with this? Which really leads to number three. The best features are tightly controlled. That’s not really open source, now is it? I expected it to be rather open, but there are caveats. I have nothing against protecting interests, but wouldn’t you just not bother if you’re imposing these limitations? Has Cisco not learned from its previous endeavors – namely ISL and PAgP, but many more that others can point out – that proprietary means lock in? Lock in equals no-no. NO means NO. Maybe I am being a bit too harsh. I have reached out to Donnie Savage with a hope to chat more about the draft. I believe my thoughts will remain much the same, but I’m always looking for another perspective. I appreciate Cisco giving this a go, this open standard thing with EIGRP. I could be missing something, but it seems this one, so far, is a misstep. More Notes: You can learn more by reading the Cisco EIGRP Informational RFC FAQ. A. Cisco is opening up its EIGRP routing protocol as an open standard in order to help companies operate in a multi-vendor environment. Any networking vendor can now freely implement EIGRP on their equipment, and interoperate with thousands of networks running EIGRP today. Advanced features of EIGRP, such as EIGRP stub, needed for DMVPN deployment, will not be released to the IETF. Q. Will EIGRP specifications change after it’s released, just like CDP evolved to LLDP? A. EIGRP is being released as an “Informational RFC”, and that allows Cisco to retain control of the EIGRP protocol in order to preserve the customer experience and deployment investments. The EIGRP protocol will not be changed. If your customer is running OSPF simply because you don’t want to deploy a proprietary protocol, there may be some EIGRP features that may benefit you. View this webinar (https://communities.cisco.com/docs/DOC-30498) for a comparison between EIGRP and OSPF strengths. A. Cisco has a 15-year head start with EIGRP and Cisco will continue to innovate in the areas of usability, scalability and high availability. EIGRP is the only protocol that can scale in a DMVPN network, and Cisco is working to scale the number of DMVPN peers further over time. Cisco is also actively working on some unique solutions that help customers solve the complexity in deploying and troubleshooting EIGRP in their networks.